My Hero Academia's spinoff, My Hero Academia: Vigilantes, is coming to the U.S. from VIZ Media, LLC next month. VIZ Media announced today that "a new series set in the world of the bestselling manga series My Hero Academia," My Hero Academia: Vigilantes, would be available on July 3. The spinoff, which highlights a different kind of heroism, got its start in August 2016 and is still being serialized. 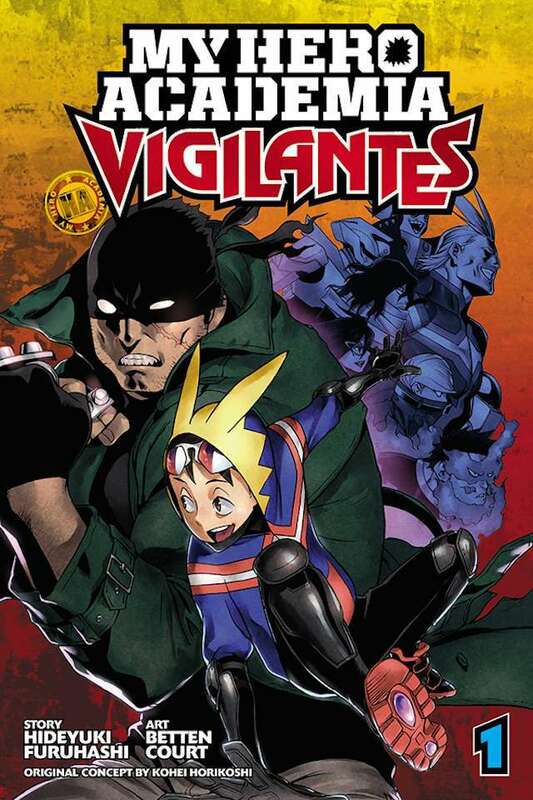 My Hero Academia: Vigilantes tells the story of man named Koichi Haimawari, a would-be hero who uses his Quirk to help others. When he and a girl named Kazuho Haneyama find themselves accosted by thugs, a vigilante known as Knuckleduster comes to save them. The down-low hero shows Koichi what being a vigilante is all about, and he decides to become one himself. However, the gig is much more dangerous than he could have imagined, and authorities do not take kindly to all the vigilantes running around Tokyo unsupervised. The spinoff gives fans a look at how the underground world of vigilantism works within My Hero Academia. When most people are born with Quirks, it is easy to see how these kind of heroes could grow. While characters like All Might stress the decline of vigilantism because of pro-hero organizations, the career does thrives in the smaller corners of city life. Pro-heroes like Eraserhead may not agree with vigilantes, but the leads of this spinoff seem to have the gang’s reluctant respect. So, there’s a chance Knuckleduster and his crew may pop into My Hero Academia one day soon. My Hero Academia: Vigilantes has been highly anticipated by American manga readers. The series is rated ‘T’ for Teens and will be published in print and digital editions under the Shonen Jump imprint. The print MSRP for Volume 1 will be $9.99 U.S. / $12.99 CAN. Digital editions will be available via viz.com and the VIZ Manga App, as well as on various e-reader platforms. Per the official release, "My Hero Academia: Vigilantes is set in a superpowered society, where there is nothing ordinary about evil anymore. Heroes, trained and licensed to protect and defend the public against supervillains, stand above all the rest. Not everyone can be a hero, however, and there are those who would use their powers to serve the people without legal sanction. But do they fight for justice in the shadows, or for reasons known only to themselves? Whatever they fight for, they are called…vigilantes." My Hero Academia creator Kohei Horikoshi is slated to appear at his first Comic Con International in San Diego later in July.